Already a Trade Partner? No need to register again - click here. If you've forgotten your login no problem, click here and we'll help you sort it. Once you have verified your details (once only requirement) you can login to the Trade Partner area for further information. It's important that your email address is 100% correct. That's why we ask for it twice! We offer genuine benefits for our members including client enquiries and £10 million PLI from just £49 (from £69 for full bands) - these benefits are available to bands immediately after joining and paying the appropriate fee. NB: We strongly advise that you choose a login name and password which is not associated with other internet sites you may use such as PayPal, on-line banking, Amazon, eBay etc. 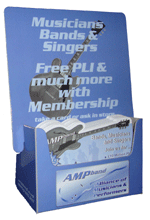 Partners with AMPband are rewarded for each member who joins as a direct result of that partners' promotion of AMPband. Registered Trade Partners can login at anytime to check the status of their account and request additional marketing material. These can be ordered from within the Trade Partner login area. Each new registration will earn you a referral credit.